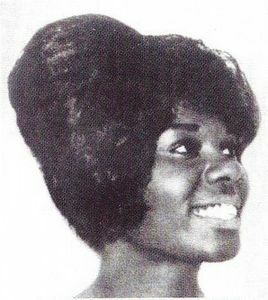 Speaking of Josephine Armstead’s partnership with Ashford & Simpson, one of the direct benefactors of their efforts was 26 year old Tina Britt. The Florida native found herself in New York recording a version of “The Real Thing.” That effervescent example of how Ashford, Simpson and Armstead could write Motown in New York saw quite a few interpretations. Indeed, Both Tina’s version and The Chiffons version mined territory that sounded like distaff Martha & The Vandellas knock offs: Tina’s Version sounding more “Heatwave ’65,” The Chiffons version sounding more “Dancing In The Streets” adjacent. Betty Everett also threw her hat in the ring with her version by the end of the year, as did Cilla Black and Dusty Springfield took to including it in her live act. Nonetheless, Tina ended up with the nice #20 R&B placing with the song. So it seemed logical that she’d tackle yet another Ashford/Simpson/Armstead composition, hopefully improving her fortunes from being a new R&B Starlet and off to the pop charts. But for whatever reason, most likely the small Eastern label, her take on “You’re Absolutely Right” failed to be the rocket it could have been. It most likely didn’t help that Tina got a taste of her competitive medicine with The Apollas of Los Angeles shortly recording a competing version shortly afterwards, and not long after that, appearing on Hollywood-A-Go Go. It was enough to sideline Tina until 1968, when she re-appeared with her Blue All The Way LP. But her first swinging outings were some of the finest moments in 1965 soul, and deserves another look 50 years on.